Going to the movies typically involves choosing between several large multiplexes. Whether it’s a nearby strip center or the local mall, tens of thousands of people flock to the films every day of the week. But the silver screen experience wasn’t always that way. In the early 1900’s and for the better half of the nineteenth century entertainment was an exclusive and unique experience. Theater goers would get dressed up and wait in line to snag a seat to a Friday night or Saturday afternoon showing of the latest flick. Similar to now, the venues themselves were a gathering place in city centers, but unlike today, back then their design was unique and reflected the era and the area in which they were built. If you want to take a step back in time, taking a seat in a historic theater is to get a snapshot into history. Let’s visit some of the most iconic theaters around the world. The Broadway Theater opened on Christmas day in 1924 as B.S. Moss’s Colony Theater and was known for screening motion pictures as well as vaudeville shows. 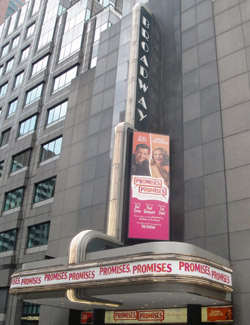 Throughout its lifetime the Broadway Theater has gone by a number of names including: Universal’s Colony Theater, Early Carroll’s Broadway Theater and Cine Roma. The Broadway Theater has been rebuilt twice since its original construction, once in 1956 and again in 1986. This landmark theater was originally built by architect Eugene De Rosa and is located at 1681 Broadway in New York City. Most notably, the Broadway Theater is known for its release of Steamboat Willie on November 18, 1928. In 1940, the Broadway Theater featured another Walt Disney release with the debut of Fantasia in Fantasound on November 13. This noteworthy landmark cinema is known for both theatrical productions and cinematic productions. The current capacity of the Broadway Theater is 1,761. Learn more about the Broadway Theater in the video below. 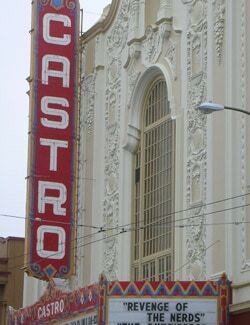 Built in 1922, the Castro Theater in San Francisco is located at 429 Castro Street. The front of the building features a huge arched window with elements of Spanish Colonial Baroque design. The current seating capacity of the Castro Theater is 1,407. The design of this landmark theater was created by Timothy L. Pflueger who is also known for his design of the Oakland Paramount Theater. While the original Castro Theater opened in 1910 at 479 Castro Street, what is currently the Castro Theater was not built until the early 1920’s. What was originally the Castro Theater now stands as a retail store. When the new location of the Castro Theater opened it was for an invitation only screening of Across the Continent. The next day on June 23rd 1922, the theater opened to the public. The most intriguing aspects of this San Francisco Theater for many is the Mighty Wurlitzer pipe organ that has long stood as a featured attraction. Before each event, the pipe organ is played. The interior of the Castro Hall is nothing less than amazing either with a domed ceiling and an incredible chandelier that hangs in the movie hall. Mann’s Chinese Theatre also known as Grauman’s Chinese Theater is located at 6925 Hollywood Boulevard in Hollywood along the Hollywood Walk of Fame. It took eighteen months to build the theater which was started in January of 1926 and completed in May of 1927. The building of the theater was overseen by Sid Grauman who had recently completed Grauman’s Egyptian Theater in 1922 also located on Hollywood Boulevard. 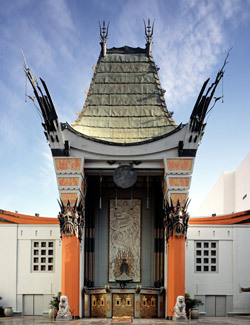 Grauman’s Chinese Theater opened with the premiere of Cecil B. DeMille’s The King of Kings and has since been host to a large number of parties, screenings and awards ceremonies. The most notable aspect of this unique theater is the Chinese design of the façade (a large red pagoda, a Chinese dragon across the front, small dragons along the roof and two large guardian dogs at the entrance). Owned by W.F. Cinema Holdings, the theater can hold 1152 people and has been renovated a number of times in its history, most notably between 2001 and 2005. One of the most popular features of Grauman’s theater is that it is a first run movie theater and a significant number of big name films have seen their debut there. The handprints, footprints and autographs at Mann’s Chinese Theater are also a big drawing point for visitors and tourists. There are approximately 200 of these concrete slabs outside the theater celebrating the careers of movie industry professionals along with a select few non-movie professionals like Kobe Bryant. The Alamo Drafthouse Theater was founded in 1997 in Austin Texas. Located at 409 Colorado Street in Austin, Texas the building began its life as a parking garage. Known for its second runs of popular movies, the Drafthouse became most well-known for having tables in front of the seats and offering waiter service to guests. Offering a wide array of food, drinks and even beer, the Drafthouse became a popular location for moviegoers. Another one of the biggest reasons why patrons enjoy the atmosphere of the Alamo Drafthouse is that children under the age of 6 are forbidden and strict enforcement is put on theater going etiquette. Such strict rules include the potential for ejection from the theater if caught texting or talking during the movie. As the theater became increasingly popular, new locations were opened in North Austin and Northwest Austin. With the opening of the second Drafthouse location that featured first run movies, the original location began to feature special runs of classic, independent and cult classic shows. In 2004 the original founders of the Alamo Drafthouse, Tim and Karrie League began expanding the theater chain opening Draft Houses throughout Texas and the U.S in Virginia, San Francisco, Colorado, New York City and more. 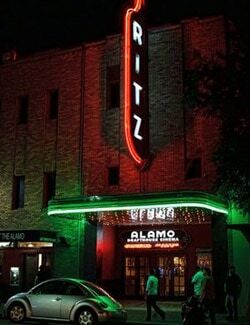 In 2007 the original Alamo on Colorado closed it’s doors and moved to the historic, newly renovated Ritz location on 6th Street in downtown Austin. The Senator is a single screen movie theater in Baltimore, Maryland. Located at 5904 York Road, this art deco themed theater first opened its doors on October 5, 1939. Designed by architect John Jacob Zink, the Senator Theater features a combination of limestone and glass blocks on its façade to give it a unique appearance. Behind the glass blocks, multicolored lights shine giving it an even more unique appearance at night. 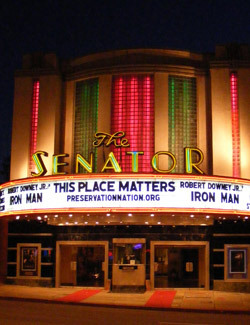 In 1989, the Senator Theater was given a place in the National Register of Historic Places. Throughout the theater even today original symbols of its art deco décor stand out. Terrazzo floors, murals on the walls and a huge gold curtain that covers the single screen make this theater a regular tourist spot as well as local hangout. When it was originally built, the Senator had 1150 seats but over time that number has been reduced to 900. Of those 900 seats there is room for 40 in the two skyboxes that are reserved for private parties. The sidewalk that runs along the front of the theater boasts a walk of fame that shines a light on local cinematic features. The Senator has made its name in history many times, such as in 2003 when it became the first cinema to complete the certification program offered by THX, Ltd. More notably for those who keep their eye on the fame game, The Senator has also played host to a number of celebrities over the years. Numerous screenings, premiers and fundraisers have attracted the rich and famous. The theater itself holds a position of fame as well. The front of the Senator Theater has appeared in numerous feature-length films and commercials and it has even been featured in books as well! In March of 2009, the theater announced it would be screening its final first run show. Just two days later the theater was closed due to financial difficulties. Two months later the City of Baltimore purchased the mortgage for the theater. Since that purchase, the theater has undergone a number of renovations including the addition of a second movie screen and a bar and restaurant. After being shut down again for further renovations including full digital system upgrades and preservation of their 35 millimeter projectors the theater is now home to screenings again. 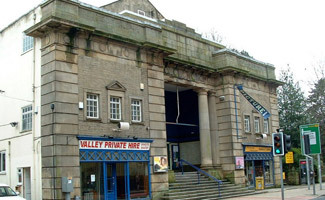 The Hebden Bridge Picture House in Hebden Bridge in West Yorkshire is famed for being one of the only remaining cinema’s in Britain that is still civic owned. The cinema first opened its doors in 1921 and played a double feature show of The Iron Stair and Torn Sails. At the time of its opening the Picture House had 900 seats. The biggest refurbishment of this cinema took place in 1978 when a little less than half of the seats were removed leaving 492 seats. While this removal was a risky maneuver leaving room for far fewer guests, it resulted in many singing the cinema’s praises due to the ample leg room it provided. The Hebden Bridge Picture House still currently runs daily evening screenings as well as matinees over the weekends and during school breaks. An additional perk that many locals enjoy is an 11am screening every Thursday referred to as the “elevenses screening.” Viewers of the elevensies screening are given free tea and biscuits to enjoy while they watch the movie. 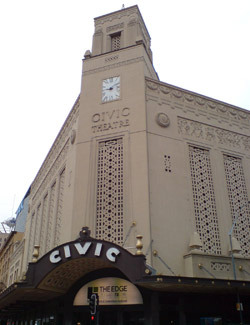 The Civic in Auckland, New Zealand is also known as the Auckland Civic Theater. This theater first opened its doors in 1929 on December 20. One of the most notable features about this theater is that it was built as an atmospheric cinema – that is, it was built to give viewers the impression that they were sitting outdoors while watching a movie. The Civic is the largest remaining atmospheric cinema in Australia and Asia – there are only seven remaining in the entire world. Inside the Civic an Indian theme touches the decor with Buddha statues and columns throughout the foyer as well as large domes ceilings. Inside the theater room itself are turrets, tiled roofs, spires and panther statues. The Civic is the largest theater in New Zealand even after its seating capacity was reduced from 2,750. Throughout its lifetime the Civic has experienced some financial difficulty, particularly since opening during the Great Depression. The Civic remains standing and active however and has even been featured in Peter Jackson’s King Kong film. 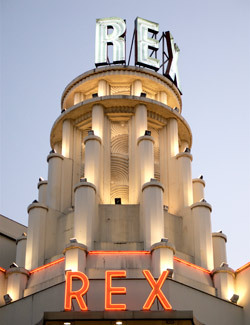 The Grand Rex or Le Grand Rex as it is known in its hometown of Paris is the largest cinema in the entire city. Like the Civic in Auckland, The Grand Rex is an atmospheric theater and even has a starry “sky” and fountains to slip viewers in to the outdoor theater role. The art deco decor of Le Grand Rex is nothing too unique as far as theaters go but the size of the movie screen is! The “grand large” is the biggest screen in a movie theater in all of Europe. In total this indoor outdoor theater is built to seat 2,800. Construction on this landmark cinema began in 1931 by Jacques Haik based upon a design of Auguste Bluysen and John Eberson. It took just one year to build the theater and it opened its doors on December 8, 1932. The theater has an amazing history, serving as a soldier’s theater to the German troops during their occupation of Paris. This is just one of the contributing factors that led to Le Grand Rex receiving protected status in 1981. Every April Le Grand Rex is host to the Jules Verne Adventure Film Festival, an event recognized worldwide by Verne fans. Noted as the most important adventure and discovery film festival worldwide, more than 48,000 attendees flock to the six-day event. Located at 478 West 6th Street in San Pedro, California, the Warner Grand Theater first opened its doors on January 20, 1931. The theater was designed by B. Marcus Priteca and Anthony Heinsbergen and has many of the art deco elements found in a number of the world’s landmark theaters. Although the Warner Grand was one of three such theaters designed and built by these two men, it is the only one of the three that remains standing. In 1982 the theater was declared a historical and cultural monument. Despite being named a building of significance, the structure was allowed to fall in to disrepair and for a period it stood under threat of demolition. In 1995 the Grand Vision Foundation was developed by a group of local activists for the purpose of preserving the building. In 1996 the theater was purchased by the City of Los Angeles and since that time renovations have been taking place. 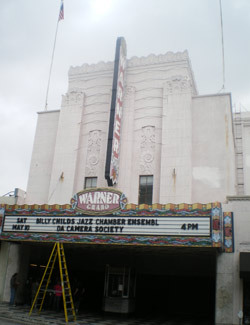 In 1999 The Warner Grand was added to the National Register of Historic Places. During its lifetime, the Warner Grand has been featured in a number of feature films and has become the home to the Golden State Pops Orchestra and The Relevant Stage: San Pedro’s Musical Theater Company. 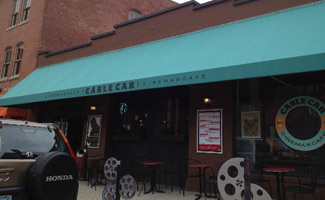 Located at 204 South Main Street in Providence, Rhode Island, the Cable Car Cinema has been in operation since 1976. This is certainly not one of the oldest landmark cinemas; however, it is somewhat unique in a number of ways. Viewers sit on couches and “living room chairs” to watch the movie of choice. Before each showing viewers are treated to live performances of various art forms rather than the more traditional preview advertisements of modern cinemas. The Cable Car Cinema has just one screen and seating for 125 people. Moviegoers are offered refreshments that include beer and wine that can be taken in to the movie screening room adding to the informal setting. Viewers are also offered the option to dine while watching the film. Throughout its history, the Cable Car Cinema has passed through the hands of multiple owners and experienced a number of renovations. Despite multiple renovations however, the informal atmosphere remains and keeps loyal moviegoers coming back. 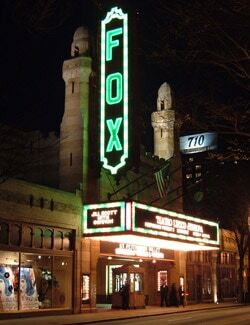 The Fox Theater is also referred to as the Fabulous Fox and is located at 660 Peachtree Street in Atlanta, Georgia. This one time theater now serves as a performing arts location; however, it maintains its original glory. Built in 1929, the Fox Theater was built to seat 5,000 under the direction of architect Olivier Vinour. The theater itself is rather unique in terms of its architectural structure as it combines elements of Islamic and Egyptian architecture. The interior of the now auditorium was built with the image of an Arabian courtyard in mind. The “sky” features crystal stars and clouds which are projected on the ceiling. The theater was originally built to serve as a Yaarab Shrine Temple to serve as the headquarters for thousands of Shriners; however, the project could not be completed. So, William Fox, the owner of the Fox movie theater chain, adopted the project and undertook a 21 year lease on the property. During its early years the Fox Theater encountered some financial difficulty but in the 1940’s new management brought the theater to life. This “revamping” of the theater was not to last however and in 1960 the theater once again hit a rough patch. During the 1970’s the Fox was in serious trouble and was facing demolition until it was placed on the National Register of Historic Places in 1974. On May 26, 1076, The Fox Theater was named a national historic landmark. Additional features to this theater which make it unique include “the Mighty Mo” a four keyboard 42 rank pipe organ and a 3,640 square foot residential apartment. Since being saved from demolition, the Fox Theater has undergone numerous renovations and remains a center of cultural and artistic gatherings. Known by most as the Sun Picture Garden, this theater is recognized as the world’s oldest picture garden to still be operational. 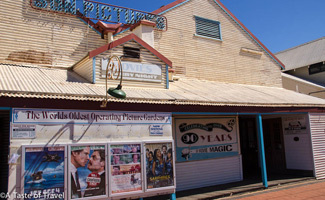 Found in Broome, Western Australia, the Sun Picture Garden is an outdoor theater that offers viewers multiple nightly showings unlike most other outdoor theaters that feature just one showing a few times weekly. Sun Pictures first opened on December 9, 1916 with the screening of “Kissing Cup. The theater played silent films until 1933 when it was modified to play films with sound. The first film with sound to be played at the Sun Picture Garden was Monte Carlo. During the 1940’s the cinema became a soldier’s cinema. One of the more unique albeit unintentional features of the Sun Picture Garden was the fact that the cinema would flood each night and it was not uncommon to see viewers wading through the streets following the film. In 1974 this flooding problem was rectified with the construction of a levy. In 1989 the Sun Picture Garden was named a National Estate and in 1995 it was added to the State Register of Heritage Places. In 1997 the theater once again changed hands and a restoration effort began in 1999. As of 2004, the Sun Picture Garden was recognized by the Guinness Book of World Records for being the world’s oldest open air cinema in operation. Today you can take a history daily during peak season at 10.30 am and 1.00pm or catch a film at the twin cinemas. 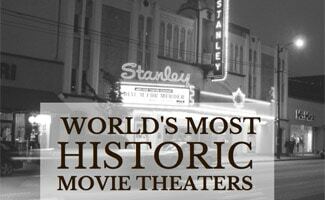 Which of these historic movie theaters have you visited? How cool, I’ve been to the Alamo Drafthouse in Austin (the original one on Colorado) but will have to add some of these others to my travel bucket list. So fun to sit in these historic venues and experience films like they did back in the day.